I LOVE 85C’s sea salt iced coffee. There’s something about the creamy frothiness and the tiniest hint of salt that really makes my taste buds happy. It’s especially refreshing on a hot summer day. I had my first taste in Irvine, and it was always one of the must-haves whenever we went down for a visit. 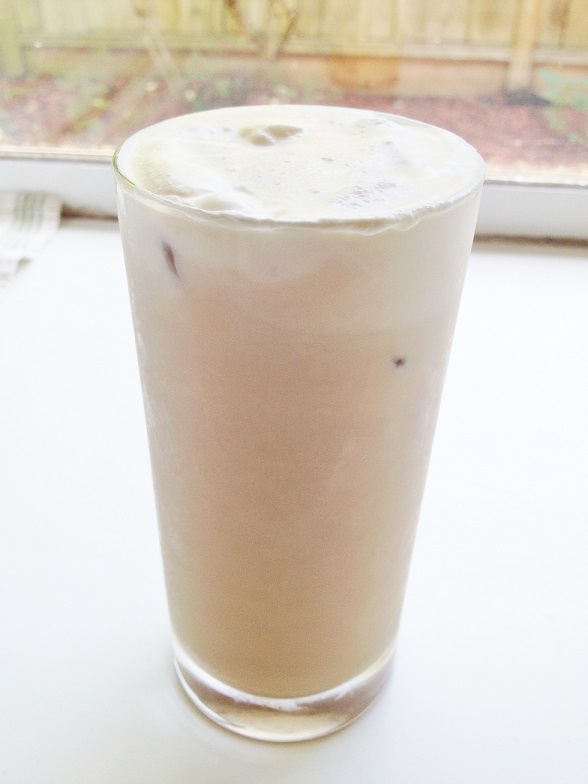 I was so excited when another milk tea shop opened up closer to home, offering Snowfall Iced Coffee, which is a very similar drink. At nearly $5 a cup, though, this wasn’t something I was willing to pay for regularly. I carefully watched them make it and of course went home and tried to recreate it. I think I came pretty close! 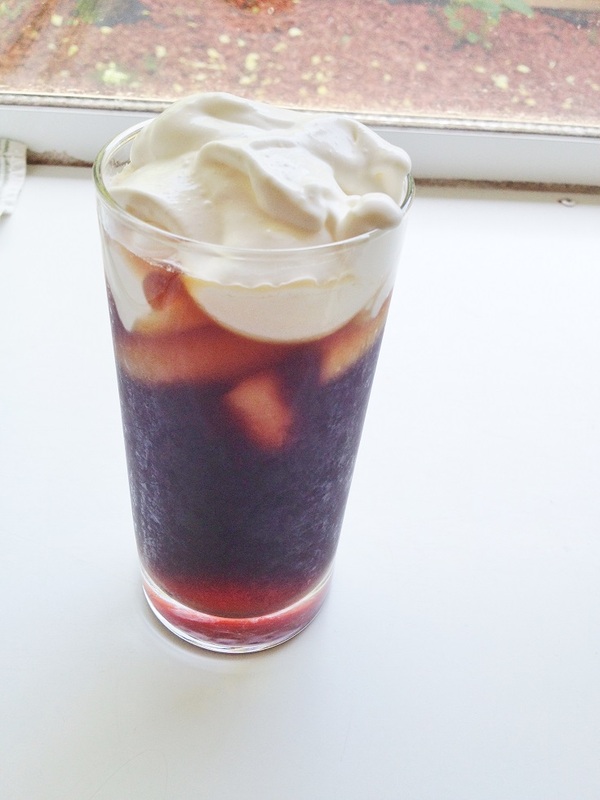 If you enjoy your iced coffee creamy and sweet with a hint of something different, give this recipe a try and tell me what you think! 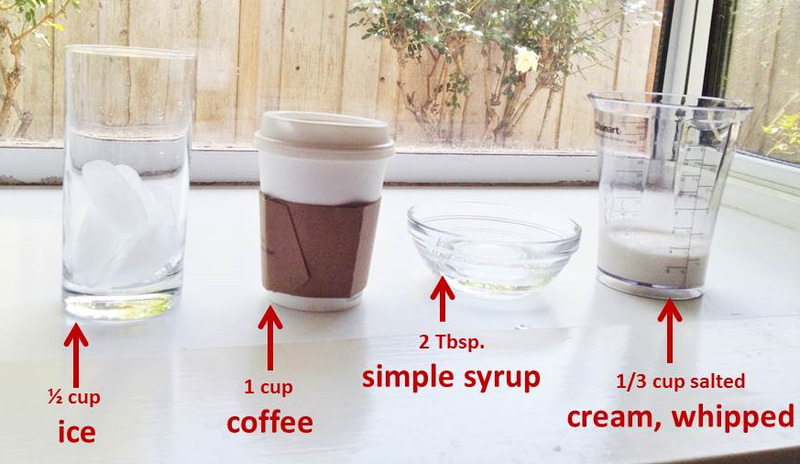 When it comes to making your own cup of iced coffee, the final measurements are flexible. Adjust the different components (syrup, cream, ice, coffee) to taste. If you like it more or less sweet, use more or less syrup. If you like it less creamy, add less of the cream mixture, etc. If you think the ice waters it down, chill all the components first and then use less or no ice. My husband enjoys this recipe with 2 tablespoons of syrup (“less sweet”), but I like 3 myself (“regular sweet”). Make simple syrup: Heat sugar and water on medium high in a saucepan until sugar dissolves and you see steam rise. It should be clear like water. Let cool. Make cream mixture: Whip heavy cream and salt together with wire attachment (or a wire whisk) until soft peaks form. Chill until ready to use. Assemble your drink: To make one glass, fill a large cup halfway with ice. Add 1 cup of coffee and 2-3 tablespoons of syrup. Stir in ~1/2 cup of snowfall/cream mixture. Stick in a straw, and enjoy! Repeat for second glass. Yep! I joined last week because of the article on teaching kids about how to say they are sorry from the heart. I also love coffee and salted anything. Double hitter this week for me! Thank you! Will definitely try 🙂 I love sea salt coffee too! I can always make it for you, Mom! Thank you for posting this! I subscribed to your blog just last week because of a parenting post that inspired me and filed it under “parenting”. So what a surprise this morning to see you blogging about one of my favorite treats, 85degree’s sea salt coffee!! Gonna try it! oh wow! i want to try that sometime. you could add an egg yolk to make it thicker and richer.